Today I will present my findings from the 1880 U.S. Census for all occurrences of the surname Kanistanaux. Laton Kanistanaux, Mulatto, male, age 46, married, farmer, he and both parents born in NY. Marleah Kanistanaux, Indian, female, age 54, wife, keeping house, born Canada E, father born Conn., mother born in Canada. Willie Kanistanaux, Mulatto, male, age 6, at home, attending school, born Canada E., father b. NY, mother born Canada. There are a number of significant items to note about this census. Layton seems to have gotten younger. In 1875 both he and Marleah were recorded with the same age, 48. Now, 5 years later Layton in only 46, or 2 years younger than he was five years ago. Once we get over 30, we would probably all like to turn back the years, but it is just not physically possible. So, either we have a error in this census or in the prior census. Even if the 1875 age was intended to be 43 instead of 48 (an easy error), Layton has only aged three years instead of five. The only way to really resolve this conflict will be to locate a birth record for him. In 1880 Marleah is recorded as being significantly older than her husband. She was 48 in 1875 and she is recorded as 54 in 1880. In 1875 they were the same age, but now she appears to be 8 years older than her husband. This points out just how unreliable census records really are! Which do I believe? Actually, neither, since a census record is not a proper vital record. 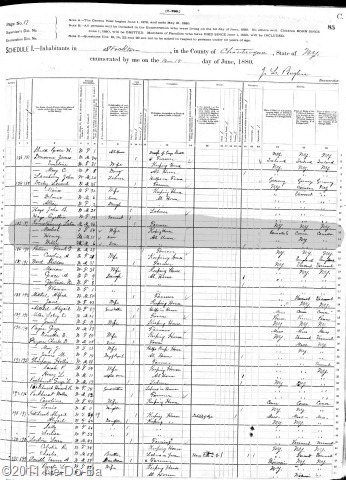 The daughter named Carrie is not found with the family in this 1880 Census. This is not surprising since she was 18 in the 1875 Census. Since she was of a ripe age for marriage, I should search for a marriage for her between 1875 and 1880. The two sons, Henry and Willie are in the 1880 Census household with appropriate ages based on the earlier 1875 ages. They are both referred to as “son” and the birth places listed for their parents match up with Layton and Marleah’s birth locations. I found no sign of the Dr. Lee-O-Netto in Stockton or elsewhere in the county. I will come back to her and this census year later and mount a determined search using all the various tricks I‘ve learned. I observed that Layton is no longer a physician but a simple farmer and Marleah is keeping house. I wonder what happened to the “Indian Doctor” occupation of just 5 years ago? I would like to point out the “color” of different the family members. Marleah is the only one recorded as “Indian”. Layton and the 2 boys are referred to as “Mulatto”. This term is applied to a person of mixed race ancestry, but generally the ancestry would be perceived to include some “white”. It appears the census taker viewed Marleah’s physical features to be all Native, but Layton perhaps appeared to have lighter skin or hair. It looks like the census taker recorded the boys as Indian, then changed his mind and recorded them as Mulatto. Viewing the original copy of this census might prove that observation to be true or false. The change makes sense if both boys were sons by blood of Layton, since they too would have mixed ancestry. Of course there was no “color sheriff” running around in 1880 making sure people were recorded correctly, so it is all rather speculative as to what criterion individual census takers used in assigning “color” in census records. One final item that should be noted – Marleah gives the birth place of her father as Connecticut and her mother as Canada. Marleah and both of the boys claim “Canada E” as their place of birth. This is a reference to “Canada East” sometimes called “Lower Canada”, both terms referring to the Province of Quebec. Since Layton is recorded as a farmer, I took a look at the 1880 Agricultural Schedule to see what sort of farm he had. I am not posting the actual document here, but the data is summarized below. He is the owner of the farm (a deed search should provide more specific information). The farm (land and buildings) is valued at $600, his farming equipment is worth $25, and his livestock is worth $65. He has 3 acres of tilled land and 2 acres of meadow or pasture. He planted 1 acre of Indian corn, 1/4 acre of potatoes, and has 10 mature apple trees. He owned no horses or mules. The farm products bring in about $100 a year. In 1879 the farm produced 6 tons of hay (but perhaps the 6 is really a 0? ), 125 pounds of butter, 3 dozen eggs, 20 bushels of corn, 30 bushels of potatoes, and $40 worth of “forest products”. Livestock consisted of 1 milk cow, probably 2 calves, 2 swine, and 2 barnyard chickens. Compared to the farms of his neighbors, this is a very modest farm.